WET, the Southern California-based, award-winning water feature design company responsible for the world’s most iconic water and fire environments, including the renowned Fountains of Bellagio inLas Vegas, today unveils its latest creation, The Waters of Olympic Park, at the Opening Ceremonies of the 2014 Winter Olympic Games in Sochi, Russia. Conceived, designed, engineered and manufactured by WET expressly for the Sochi Games, The Waters of Olympic Park is a creative and technological showpiece featuring choreographed water, fog and light. All the elements perform in unity, under the direction of WET’s longtime choreographers, to the music of Russian composers, including Tchaikovsky and Khachaturian, in celebration of the 22nd Winter Olympic Games. In addition to being featured in the Opening and Closing Ceremonies, The Waters of Olympic Park serves as the epicenter of Medals Plaza and the backdrop for the medals ceremonies. It is designed also to function as a social centerpiece and entertainment hub for athletes, attendees and the global viewing audience. Russian general contracting firm Stroi International created the environment that houses the fountain. Following the close of the Games, the fountain will be gifted to the city of Sochi and remain a permanent attraction. The Waters of Olympic Park measures 75.3 meters (roughly 247 feet) in diameter and holds approximately 700,000 gallons of water. 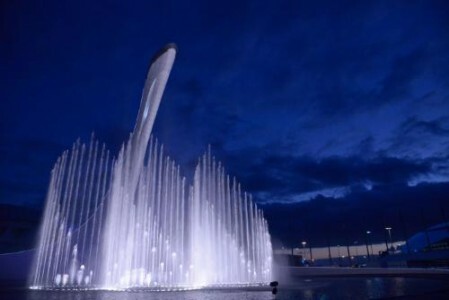 The design features five symbolic Olympic rings formed from hundreds of WET’s air-powered Shooters® which launch vertical columns of water up to 70 meters (230 feet) in the air. Interwoven with the Shooters® are WET’s motion-controlled robotic nozzles which create sweeping fans of water that pirouette across the fountain’s basin. Swirls of fog also glide across the surface, creating an aura of suspense before synchronized plumes of water emerge from underneath. At night, the columns of water transform into ultra-vibrant liquid fireworks, infused by hundreds of underwater, theatrical LED-powered stage lights (the brightest colored LED lights in the world). The drama is further enhanced by the feature’s “night sky” effect, with thousands of twinkling “stars” appearing within the waters of the fountain, mirroring the sky above. The proprietary technologies used in The Waters of Olympic Park are all created, engineered and manufactured by WET to produce a magical, emotional and unique experience. Though all elements of WET’s sophisticated and remarkable creations are conceived and made in the United States, the fountains ultimately are designed to become symbols of the communities in which they reside.